Black and white image of two people standing in field with a farm in the background. 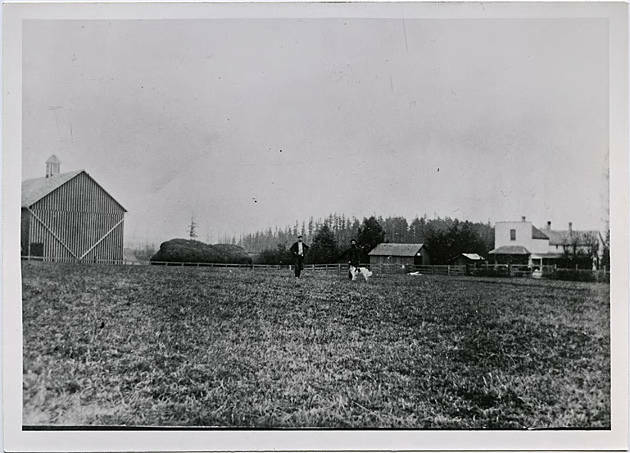 A dog stands with one person, and a barn is off to the left side of the image. In the background are other outbuildings and a farmhouse in an 'L' cross-gabled shape with a square front facade. A large haystack sits to the right of the barn, and two of the pine trees in the center of the image are larger and fuller than any of the others visible in the background. The ground appears to have been plowed under for winter. [back][pencil] Sam Gerber planed the 2 pine trees about 1900. 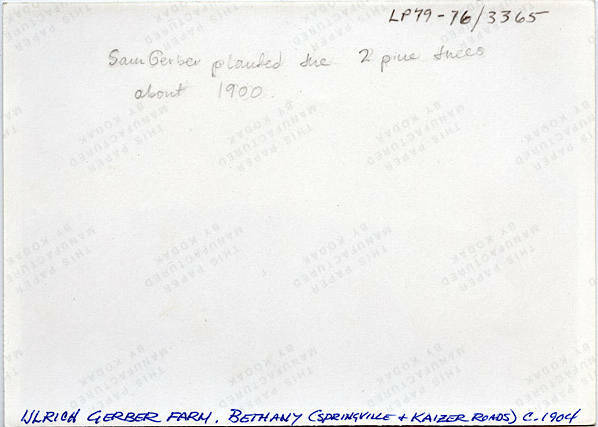 [pen] Ulrich Gerber Farm, Bethany (Springville & Kaizer Roads) c. 1904.